Mary Hull Webster at Krowswork gallery. 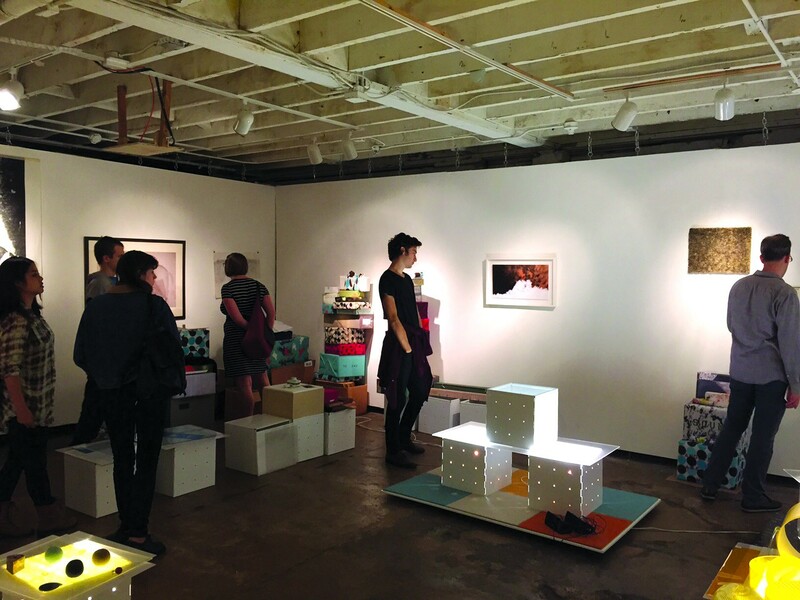 During her residency at Krowswork Gallery (480 23rd St., Oakland), Mary Hull Webster created a cloud of stuff. Her immersive installation, Cumulous, fills an entire room and consists primarily of plastic boxes stacked atop one another. Some of the boxes light up, and many have other objects — orbs, photographs, upholstery, panes of glass — placed on top of them. In one corner, broken electronics lay forgotten on the floor, emitting a tangle of wires. In another, a square piece of mustard yellow carpet hangs near an ink-jet print of a digital texture that resembles a mustard yellow carpet. Cumulous successfully evokes a mental landscape that discards expected tropes of Freudian whimsicality, instead opting for absurdities of the post-internet age. In doing so, it offers an image of what our personal memories might look like when they are digitally stored in the “cloud.” Webster will speak about her work in conversation with Krowswork director Jasmine Moorhead at the closing reception of the show on October 10, at 3 p.m.